The Natick Historical Society, founded in 1870, is the place to find out about all things Natick-- landmarks and landscapes, personalities and peculiarities, events and experiences. We celebrate our community's rich history, from before its origins as the most successful Massachusetts Praying Indian Town, to its Oldtown days made famous by Harriet Beecher Stowe, through to the important center of culture and commerce in the MetroWest region that it is today. We collect and conserve artifacts, papers, and materials important to the origins, development, and ongoing life of the town. We provide rich educational experiences about Natick history, based on authentic objects, primary sources, stories, and lives that engage seniors, families, and school group audiences in programs, exhibitions, and publications. Our Natick History Museum is located in the lower level of the building at 58 Eliot Street, Natick. Our Research Library and Office is located at 207 Union Street, Natick (just across the street). 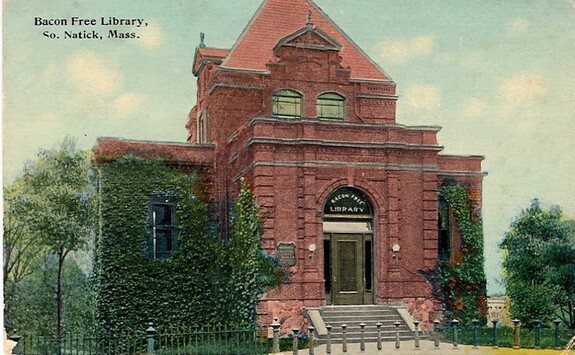 The Natick History Museum, 58 Eliot Street, Lower Level, Natick, is open Tuesdays, from 10 am to 6 pm; and the first Saturday of the month, from 10 am to 1 pm. Research Library and Office located at 207 Union Street, Natick; open Wednesdays, 1 to 4 pm, and by appointment. Research Library is not wheelchair accessible.